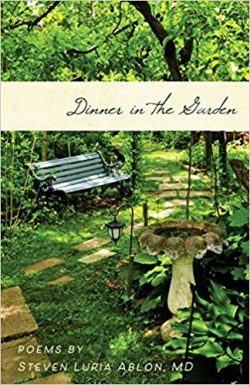 Dinner in the Garden, a new book of poetry by our member, Steven Luria Ablon, explores how families interact and evolve and brings to play the deepest feelings. Dr. Ablon is a Training and Supervising Adult and Child Analyst at BPSI and an Associate Clinical Professor of Harvard University Medical School at Massachusetts General Hospital. He is a winner of an Academy of American Poets Prize. Ablon’s earlier books of poems are Tornado Weather (Mellen Press, 1993), Flying Over Tasmania (Fithian Press, 1997), Blue Damsels (Peter Randall Press, 2005), and Night Call (Plain View Press, 2011). Among his psychoanalytic publications are two books, The Development and Sustenance of Self-Esteem in Childhood (1983) and Human Feelings: Explorations in Affect Development and Meaning (1993), as well as numerous articles on child analysis, dreams, technique, play, and children literature. One poem from the new book is published here with author’s permission. our household, get it right this time. ballet recitals wedged into auditoriums? Didn’t we study biology and Latin? let us grill them about courses, friends. They hug us, say they will see us soon. a vein, a capillary far from the heart.